Even if money's tight there's no need to miss out on a great Black Friday deal; here's what you can get for under £50. There are loads of amazing Black Friday deals to be had today, but with payday just around the corner you might not have the readies available to nab yourself a sweet bargain. There's no need to miss out, though; while we're relentless in our mission to point you in the right direction for epic savings on high-end tech, we're also keeping an eye out for those of you with a little less cash to flash. 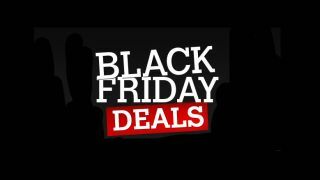 That's why we've been on the lookout for a budget selection of Black Friday deals that'll delight even the most impecunious designer. Everything here is yours to grab for under $50/£50; get a move on so you don't miss out! Save $9.04: Need a cup of coffee, like, now? This coffee maker will brew you a cup in one of three sizes in under a minute, and it won't occupy too much in the way of desk space. Save $81.01: If you need a bit of downtime this quadcopter's a perfect distraction; with 360 eversion, throw-to-flight, and headless mode flight, this drone is great for beginners and pros alike. Save $14.64: Everyone loves a bit of shredding, and this model offers performance as well as extra security. It'll do eight sheets at once, and it'll also destroy your old credit cards. Save $30.00: It's no iPad Pro, but the Amazon Fire's a cheap and cheerful tablet that does the job (and it's a great way to keep the kids off your actual iPad). Save $20.00: Google's tiny home hub will answer questions and control your smart devices, and if you get it cheap from Best Buy they'll throw in a free $10 e-voucher. Save $100.00: Wireless in-ear headphones aren't for everyone - too easy to lose, we reckon - but with $100 off it's hard to resist these Jaybirds, and you won't mind quite so much if they disappear. Save $50.00: For decent-quality audio wherever you are, this tiny speaker from Altec Lansing packs quite a punch, and it's available in either black or aqua. Save $10.00: Want to enjoy video games like they were in the olden days? The Flashback recreates the classic Atari VCS in a handheld format, and comes with 70 built-in games including Pitfall!, Pac-Man and Centipede. Save $7.30: The last thing you want when you're out and about is your phone running out of juice. Keep this bargain charger to hand and you'll be able to keep going for ages; it can deliver three iPhone 7 charges at lightning speed. Save £30.00: This dandy little coffee machine is Bosch's most compact model yet, and it's excellently easy to use, featuring Bosch's Intellibrew technology that'll help you make a variety of drinks at the touch of a button. Save £15.00: If you want an unobtrusive Alexa, this tiny Amazon Echo is just the thing; play music, control smart home devices, provide information, read the news, set alarms and more, and all in a compact package. Save £20.00: Another bargain tablet at an even more bargain price; what's not to love? This 8 GB tablet has a 7-inch display and up to eight hours of battery life; ideal for sticky little hands. Save £70.00: HP's latest thing is Instant Ink, delivered to your door as you need it, and this wireless photo printer and scanner comes with a free four-month subscription. Save £3.50: Cloud storage is great, but if you're working with huge files and you're in a hurry, it's not always an option. This flash drive will hold 128 GB and transfer it at high speed over USB 3.0 - much better than having to wait for your work to dribble into Dropbox. Save £14.99: When you're working from home you don't always want to be stuck at your desk, and with this wi-fi extender you can wander a lot further with your laptop. Save £30.00: Keep yourself in shape with this slimline fitness wristband. It features a built-in GPS, heart rate monitoring and up to 21 days' battery life, it's waterproof up to 5ATM and it'll even give you a professional workout report. Save £15.00: 99p cheaper than the Alexa Echo Dot, the Google Home Mini works in much the same way, offering voice commands, streaming music through its integrated speaker and control of your smart home devices. Save £10.00: Designed for moderate use, this cross-cut shredder will hold up to 15 litres of shredded paper, can run continuously for five minutes and even has a safety lock to prevent accidents. Save £6.00: If 128GB of flash storage isn't enough for you, this portable hard drive from Seagate holds an entire terabyte and comes in a variety of colours. Save £20.00: What's that, you reckon £19.99's a bit steep for a laptop case? You drive a hard bargain. All right, how about if we throw in this wireless three-button mouse as well? Now we're talking.